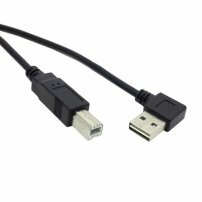 USB 2.0 Angled (90°) Type-A Male to Type-B Male Printer, Scanner Data Cable (USB 2.0 AM/BM, 20cm) : allputer.com - Accessories for all your Portable Electronics & Computers! Make the most of every inch of your workspace! This 8-inch (20cm) Angled USB A - Straight USB B Male Nikel plated Extension Cable features a handy, right-angle plug for tight spaces where a straight USB connector would not fit. This cable includes nikel-plated connectors for superior conductivity and fast, error-free data transmission. - Super Short, no tangling, no knots. - Net Weight: 100g approx.